You are a few steps from the vacation of your dreams. STAYS AND RATES: We offer a Daily, Weekly and Monthly rates, with a two-night minimum stay. You can review the property rental listings for the individual rates. Our pricing is set up depending on the property location, views, décor and amenities. All property rates include up to 4 people. Additional charges apply with 5 or more guests. CHECK-IN TIME IS 3:00 PM - At the cabin address provided to you in the accompanying e-mail with the confirmation of no balance payment. You will contact us by phone at the time of your arrival. Keys are NOT available until the property is ready for occupancy. No exceptions to this policy will be made. Agent will use reasonable efforts to have the premises ready for Guest occupancy at check-in time, but Agent cannot guarantee the exact time of occupancy. Please confirm with management time of your expected arrival. CHECK-OUT TIME IS 10:00 AM - Check-out takes place by contacting Agent (s) by phone. Agent(s) need adequate time to prepare the property for the next guest. Please leave the keys in the lock box before departure; if your property has keypad, be sure the door is properly close, but DO NOT MOVE THE INSIDE KNOB, this will disable the electronic keypad. Unless prior arrangements are made in writing with Agent, Guests that do not vacate the rental property and return the keys by 10:00 AM will be assessed a fee equal to the rental rate for (1) night. Same applies in the event Guest returns to the premises without the consent of the Agent. RESERVATION REQUIREMENTS - The minimum edge required to make a reservation is 25 years old. 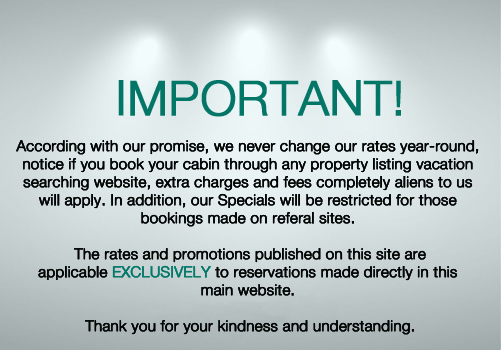 The 50% of the total rental fee must be paid by credit/debit card and is required in advance to hold a reservation. Balance is due 30 days prior to check-in with Visa, MasterCard, and Discover. Balance will automatically be applied, 30 days prior to check-in, to the credit card on file unless otherwise notified. Upon receipt of reservation final payment and signed Rental Agreement, confirmation, directions and security codes for the cabin will be forwarded to Guest. WE DO NOT ACCEPT PERSONAL/BUSINESS CHECKS AT CHECK-IN! CONFIRMATION - Confirmation of the reservation will be emailed to Guest(s) upon receipt of the reservation advance payment. Please read the confirmation for accuracy of dates, mailing address, number of adults and/or children and accommodations. Any errors must be communicated within seven days of confirmation email. Pay close attention to the number of persons (Adults/Children) on the confirmation and lease. Occupancy is limited to registered Guests only. All paid reservations are Guaranteed. ADDITIONAL GUESTS - Additional guests and visitors spending the night must be approved by Agent(s) in advance. Each child 4 years or older counts as one guest. For approval of additional guests, you will be charged $12.00 per night per guest. Violation of this clause will result in immediate eviction and forfeiture of all monies. TRIP TRAVEL INSURANCE - For your protection Trip Travel Insurance is recommended. This will protect you from situations that are out of anyone’s control. For a nominal fee, you can select the travel insurance option at reservation time or call our office to have it added to your reservation. Sorry, WE DO NOT HONOR EXTERNAL TRAVEL INSURANCE PROTECTION. CANCELLATION - A $100.00 administration fee is assessed for all cancellations; if you cancel 30 days prior to scheduled arrival or if you cancel within 30 days to scheduled arrival. However, if Guest(s) cancels less than 30 days prior to their scheduled arrival date, even if the cancellation is within 24 hours to scheduled arrival, the entire advance payment will be forfeited. No Cash Refunds Are Given! For a refund of monies, cancellation must be in writing, sent certified mail and received 30 days prior to scheduled arrival date. PETS (DOG(S) ONLY) – We welcome ONE family dog free of charge, second dog will be charging an extra fee. Most of our properties are dog friendly; however, you acknowledge that NO PETS are allowed in or on the premises unless Agent(s) has expressly authorized such use. Some homes allow pet(s) (DOG(S) ONLY). Pet limits vary by house. Our No Pet homes do not allow pets anywhere on or about the premises. Prior permission must be granted. Specific rules must be followed. Sorry, Cats are NOT permitted under any circumstances; please help us to keep all guests/owners safe and allergies free. LISTINGS & PRICING - Information regarding individual listings is believed accurate but cannot be guaranteed. We have made every effort to ensure that all the information on Agent(s) website is current and accurate. The possibility of errors and omissions exists. We will be happy to confirm all data contained herein or answer any questions you may have prior to booking your reservation. Rates, furnishings, fees, and taxes are subject to change without notice. Rates for weekly stays are shown on our website at www.GeorgiaEMR.com, all rates are based on a party of 4 and include one "FREE NIGHT"(7th Night). Rates do not include tax and are subject to change. Most of our properties can be rented with a two-night minimum year-round. Minimum night requirements may vary for holidays & special events. 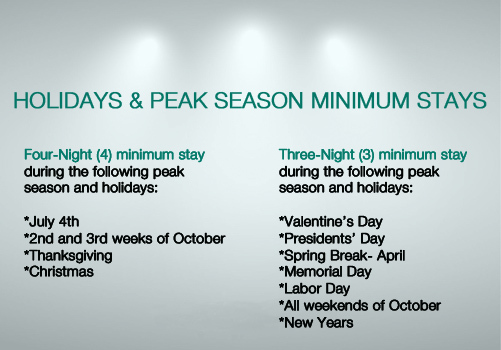 We DO NOT increase Rates during Holidays or Peak Season. CLEANING REQUIREMENTS – Guest(s) are required to leave the property in the same general condition it was when Guest(s) arrived. Dishes should be cleaned and put away, but beds do not need to be made. Agent(s) will dust, vacuum, sanitize, and clean all towels and linens upon your departure. If additional cleaning is required, appropriate fees will be charged to your account. Guest(s) is responsible for any damage, abuse, excessive cleanup requirements, or loss caused by any member of Guest(s) party to the property or its contents during Guest(s) occupancy. Inspectors walk through each property after check-out to ensure the property is left in good order. Agent(s) will make that final determination of the necessity of any charges to Guest(s). Maid service and other cleaning arrangements during your stay are available for an additional charge. 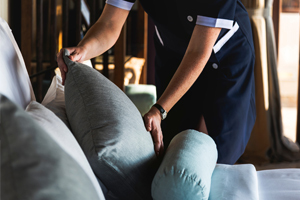 We are proud of the work performance of our Housekeeping Team, however, sometimes we make mistakes, if you are not completely satisfied with the cleanliness of your property, please notify immediately upon arrival to the Agent(s) to remedy the situation. HOT TUB - Hot Tubs have been drained and cleaned prior to your arrival. There will be a $35.00 charge if Guest(s) requires an additional cleaning of the Hot Tub during the stay. Children under 10 years of age are not permitted in Hot Tubs. No drinking of alcoholic beverages is permitted in the Hot Tubs. No glassware and/or glass bottles are permitted in the Hot Tubs. Please help us to ensure for your and your family a happy and safe stay. REPAIRS ~ SERVICE CALLS~ REFUNDS – We prepare the cabins prior to arrivals to ensure all equipment is in good working conditions. We cannot guarantee against mechanical failure of heating, air conditioning, Hot Tubs, TVs, Satellite Receivers, VCRs, or other appliances. Please report any inoperative equipment to our office immediately. We will make every reasonable effort to have repairs done quickly and efficiently or move Guest(s) to a different property if possible. All maintenance requests must be reported to the office between 9 AM and 5 PM. PLEASE do not put off notifying us immediately as it could hinder us getting the repair done quickly. Please keep in mind that the property has been reserved and held for you and that others may have been turned away. We always appreciate your kindness and consideration. RETURNED ITEMS - We will be happy to send you those personal items you left behind in the property. All returned items that guest forget in the property will have a $25.00 charge plus the cost of the packaging and mailing postage. SMOKING – Smoking is not permitted inside any property. Outside smoking is permitted, but please do not litter, you will find ashtrays to dispose cigarette buts, if they are in the floor of porches or grounds around the property, there will be an extra charge for extra cleaning. ALCOHOLIC BEVERAGES – No drinking of alcoholic beverages by persons under the legal age of twenty-one (21) is allowed. Should a Guest(s) or guest of Guest(s) be arrested for underage drinking at the rental unit property or should Agent(s) observe a Guest(s) or guest of Guest(s) under the age of 21 drinking alcoholic beverages, this Rental Agreement may be terminated and the Guests evicted at the discretion of the Agent(s). Illegal drug use is strictly prohibited. Kegs are not permitted on any property. ALL OUR CABINS ARE DRUGS FREE! HOUSE PARTIES ARE NOT ALLOWED! - Rental Guest(s) understands that we will accept families and responsible adults over the age of 25 ONLY. Guest(s) agree that more than the number of people stated on the lease shall not occupy the premises. If the unit is occupied by more than the number of people stated, it will result in loss of total rent, and/or additional charge to account. Occupancy in use of premises shall not be such as to disturb or offend neighbors. The use of firearms and/or fireworks is strictly prohibited. Guest(s) certify that they have read carefully the limitations placed on the number of persons permitted to occupy the premises and agree to abide by such limitations. College parties are strictly prohibited.